Full Spectrum CBD Hemp Oil topical soothes sore muscles. Creamy, never greasy. Their Equine anti-inflammatory cream is Terpene Rich and 100% Organic! 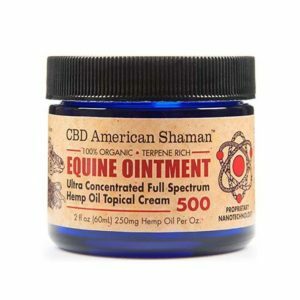 CBD American Shaman uses the best quality hemp oil containing high amounts of CBD (Cannabidiol). USA Made. 100% Natural-Pure, Non GMO Hemp and has No Heavy Metals or Insecticides. Quality tested using Ultra Performance Convergence Chromatography. Certified organic ingredients.